Ill. Frank G. Lutz, Jr.
Ill. Frank G. Lutz, Jr. was born April 11, 1927 in Evansville, IN to Frank G. Lutz, Sr. and Rachel O. (Reynolds) Lutz. He attended Henry Reis grade school, Central High school and the University of Evansville. He married Joyce L. Gumbel March 11, 1950 they had two daughters Debra Sue and Tamms Rae, and one son Frank G. Lutz, III. He was a member of St. Paul’s United church of christ, and served as Deacon on the church consistory. Frank was president and owner of Lutz Trim Shop, Inc.
Frank was raised a Master Mason at Evansville Lodge # 64 July 11, 1949 he served as Junior Steward 1955 and worked up to Most Worshipful Master in 1961. He became a member of York Rite chapter # 12 May 21, 1960, Cryptic Mason of Simpson Council # 23 June 1, 1960, Knight Templar – LaValette Commandry # 15 November 26, 1968. He joined the Scottish Rite Valley of Evansville November 11, 1952, served as Junior Warden from 1961 -1963, and went through the ranks to Thrice Potent Master from 1967 – 1969. 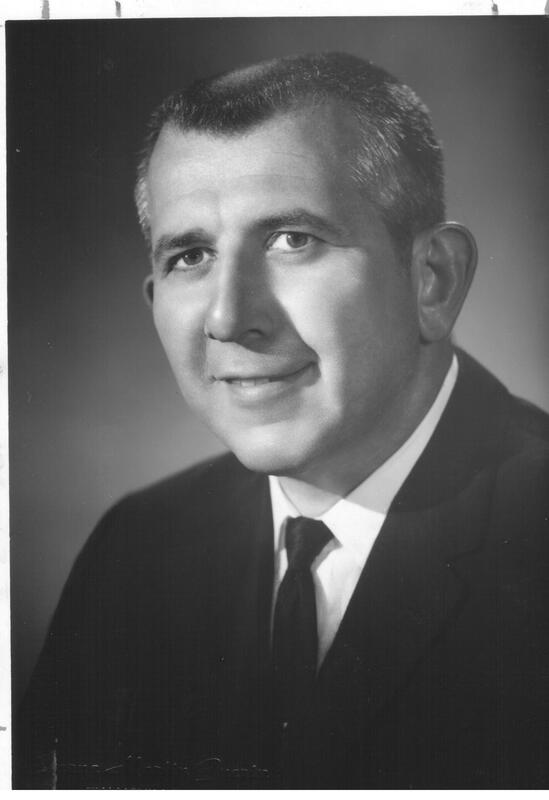 Frank served on the Mayors Human Relations Committee in 1959. Served in the United States Army14Th Infantry regiment, 1St division P.F.C. Germany. Frank is a member of the West Side Nut Club, American Legion, Past Masters Club where he served as president in 1968. He was a member of the High Twelve Club, The Automobile Club of Southern Indiana, and the United Commercial Travelers. Frank was crowned a Sovereign Grand Inspector General 33° in Milwaukee, WI in 1970.